The GMC Yukon hit its fourth generation with a complete redesign in 2015. The fourth-generation GMC Yukon brought in an all-new look, but the large SUV continued to buck the trend of SUVs downsizing to smaller, nimbler crossovers and retained its massive body-on-frame design and rugged looks. When the 2020 GMC Yukon hits showrooms, we expect it to carry over unchanged. As a carryover model, we expect the 2020 GMC Yukon’s look to remain the same. This means it will retain its upright design and boxy body it’s had since 2015. 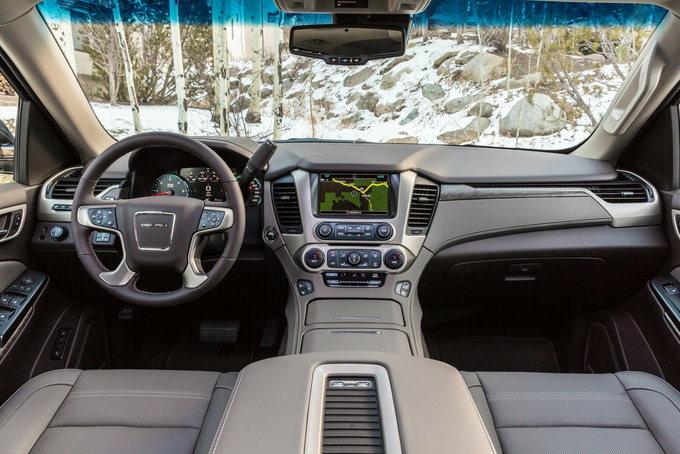 Inside, the GMC Yukon softens up a little with more curves and creativity, eliminating the truck-like look these larger SUV frequently have inside. We expect the cabin design to remain the same in the 2020 GMC Yukon too. If you seek something new, GMC may redesign the Yukon in 2020, making it ready for the 2021 model year. With no visual changes, we also expect the 2020 GMC Yukon to continue with the same well-stuffed standard features list. If this proves true, it the 2020 GMC Yukon will come standard with cloth upholstery, 18-inch wheels, an 8-inch infotainment system, Apple CarPlay, Android Auto, three-zone climate control, and more. Under the 2020 GMC Yukon’s hood, we expect everything to remain the same. If this is the case, most of the 2020 Yukon lineup will boast a 5.3-liter V8 engine with 355 horsepower and 383 pound-feet of torque. There will also be a 6.2-liter V8 with 420 hp and 460 lb-ft of torque that will come with the range-topping Denali model and will be available as a part of the Graphite Performance Edition package. We also expect the transmission options to remain the same: a six-speed automatic for the base engine and a 10-speed automatic for the 6.2-liter engine. The current GMC Yukon has not been through full safety testing by the IIHS or NHTSA, but the latter gave it a five-star side-crash rating and a scary three-star rollover rating. Low-speed automatic emergency braking is available on the SLE trim and standard on all others, but buyers can also opt for full-speed automatic emergency braking on SLT and higher trims. We expect all the safety ratings and equipment to remain the same in the 2020 GMC Yukon. There is no official release date for the 2020 GMC Yukon, but we expect it to start production in June 2020. With no changes coming, we expect its pricing to remain close to the current model’s price range of $50,895 to $73,795 (destination fees included). The 2020 GMC Yukon will battle the Chevy Tahoe, Ford Expedition, and Toyota Sequoia.